Der Link von MaGoth scheint nicht mehr zu funktionieren. It seem that some links are outdated. Look for the G2NoTR-SystemPack-1.7.exe here. I seem to be having a Problem with the Systempack. I wanted to play Odyssee 2.5 and went down the installation guide. Everything seems to be workin just fine. No errors or anything. But the problem I have is, that i dont get more than 17-18 fps. After a long period of trying (with always clean g2 dndr installs) i figured why not try it out step by step. I dont know what is causing my system to not work with the systempack, maybe somebody has an idea or there was already a similar problem. Changing the grapic settings in ANY way/combination does not lower or increase the fps by the way. As i said, maybe somebody has an idea. Last edited by insxsicht1338; 16.11.2018 at 13:21. Can someone make the developers aware of this? Fullscreen exclusive mode is BROKEN. Read my other post on page 9, and insxsicht1338's post... The FPS fix is non-functional in full screen exclusive mode on the latest version of Windows. Have you tried to disable the Windows 10 fullscreen optimization setting in the properties of the Gothic2.exe? Can we expect in the nearest future any new release? What to do when my systempack.ini file is missing? Yes I reinstalled everything and yes I launched the game and even played it for a little. Last edited by pawbuj; 18.01.2019 at 19:42. Yes Borderless Fullscreen mode works and is a solution. What I was saying is that Fullscreen Exclusive mode doesn't work (non-borderless) as its fps stays around 20. I'm just informing you of an issue. The application seems to switch resolutions just fine but then this error happens. This happens both in fullscreen as also in borderless window or windowed mode. Any ideas? I know die DX11 renderer handles this resolution just fine but it has it's own problems. 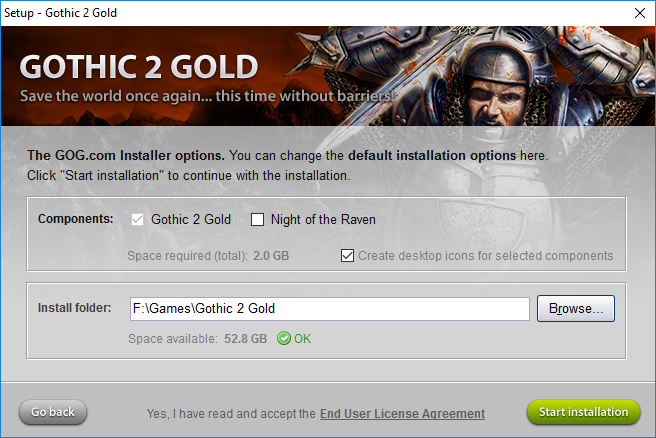 Hi, I have downloaded the G2 Classic Version of the SystemPack and I am using the 1.32 Gothic II from GoG Gold Edition without the NotR expansion, yet when I try to install the SystemPack the installer doesn't recognize the folder where the game is installed. Someone that can help? If you have the Gold Edition from GoG, then you have the NotR expansion too. True, maybe I didn't make myself clear, I only installed Gothic II without NotR, turns out the game runs much smoother for me without the expansion and I actually found out that you can mod the original game without the need to install the addon, however I have issues with screen resolution and would like to have the option to disable the animation when picking items, that's why I need the systempack. I am just wondering. I also have the GoG Version of G2 and I didn't know that it is possible to install it without NotR. How? NotR is installed automatically. Its one installer. I also like Gothic 2 Classic more, but how did you find out, that you can mod the original game without to install the addon? Can you elaborate on this? I thought thats only possible by using the Gothic 2 Classic Mod Ressources for NotR. Because of some changes in d3dim700.dll file in Windows 10 1809, SystemPack can't patch it, so the resolutions higher 2048 pixels won't work. As temporary solution you can copy d3dim700.dll file - LegacyD3DResolutionHack_MSVC6.zip to the game folder (Gothic II\System\). Don't worry about version downgrade, you will not lose anything because of this. 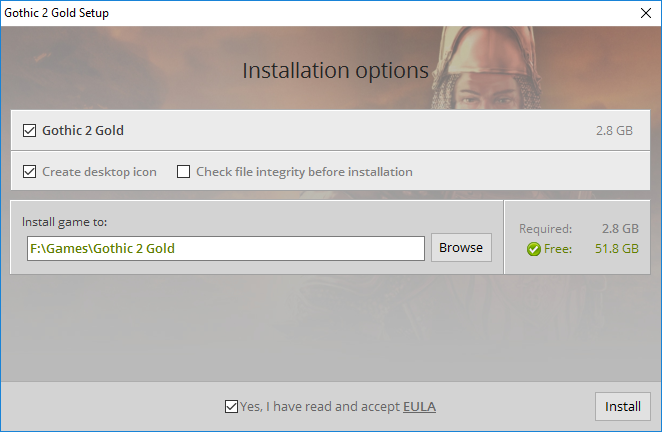 There are two versions of GOG installer. In the old version you can install G2 without addon. In the new version you can install only G2+NotR. Thanks. Too bad. They shouldn't have change this.